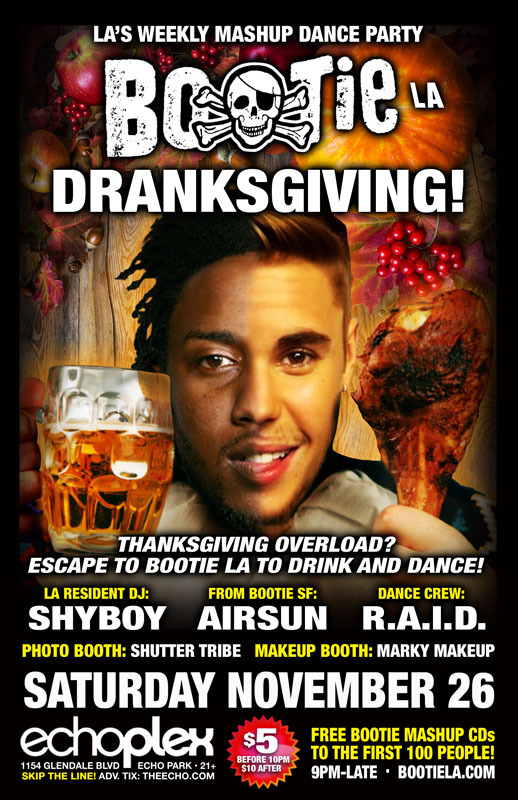 Los Angeles BOOTIE LA – Dranksgiving! Thanksgiving is finally over, and Bootie LA is here to help you recover from too much time with your families -- and to help you burn off all that food you ate -- by dancing to the greatest mashups in the world! It’s Dranksgiving! No genre or era is safe! Only $5 before 10 PM! Free Bootie mashup CDs to the first 100 people through the door! SKIP THE LINE & GUARANTEE ENTRY! Thanksgiving overload? Escape to Bootie LA to drink and dance! Thanksgiving is finally over, the leftovers are well on their way to being memories, your family is gone and the house is quiet. Now it’s time to trade out those turkey-stuffed calories for some booze-filled ones and come dance to a delectable assortment of the world’s greatest mashups, served up by resident mashup chef ShyBoy, who will be joined by Bootie SF’s Airsun, as they keep you dancing late into the night! Plus resident dance crew R.A.I.D. (Random Acts of Irreverent Dance) gives your brains the serotonin kicks they need with their go-go antics, while Marky Makeup gives your faces and bodies a makeover, and Shutter Tribe captures all the fun! All this, plus FREE Bootie mashup CDs for the first 100 people through the door! Launched in 2003 by San Francisco DJ duo A Plus D, Bootie was the first club night dedicated solely to the then-new bootleg mashup — and is now the biggest mashup event in the world, with regular parties in several cities across the globe. Winning various nightlife awards for the past 13 years, Bootie celebrates pop culture both past and present, keeping your brain guessing and body dancing with creative song combinations that provide the soundtrack for the A.D.D. generation.